If you suspect a memory leak on your computer, you should run some tests. Many memory test software utilities are available for purchase. However, the Microsoft Vista operating system includes, by default, a tool to test the computer's memory. 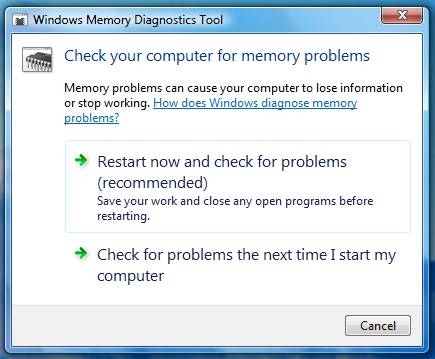 Using the memory testing tool will require you to reboot your computer. In the Search input box at the bottom of the Programs menu, type "memory." The Memory Diagnostics Tool will be listed as an option in the search results. Select the Memory Diagnostics Tool to run, and a dialog box will appear. 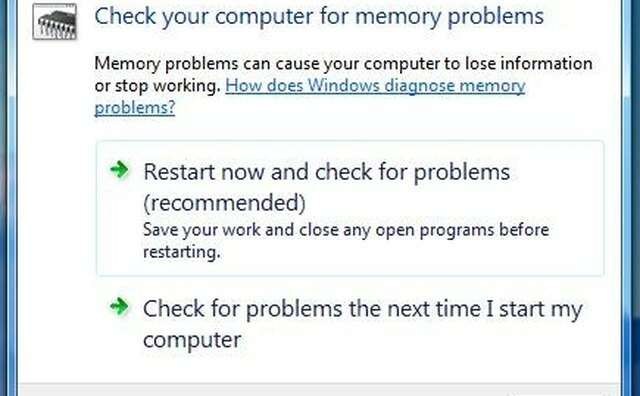 This box will ask whether to reboot and run the memory diagnostic now, or to schedule a diagnostic checkup the next time you start the computer. Select the first option, "Reboot Now and Check for Problems (Recommended)." The operating system will reboot and automatically start the memory diagnostic tool. A blue screen with a progress note will appear while the diagnostic tool is running. When the tool has finished, the results of the memory tests will appear on the screen. Type the Enter key to exit the memory diagnostic tool and reboot the operating system into normal mode.